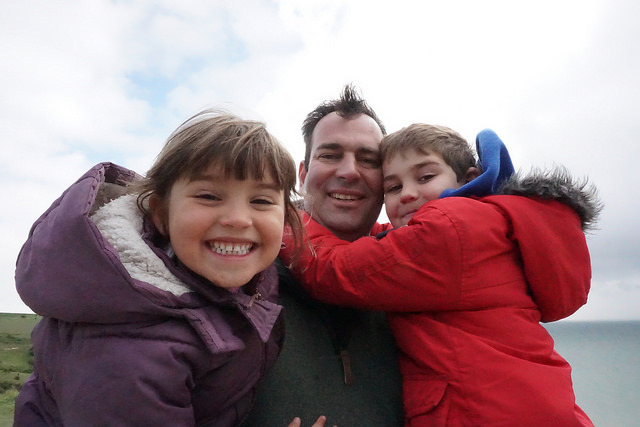 On the spur of the moment, we decided to take the kids away for a night over the May bank holiday weekend. 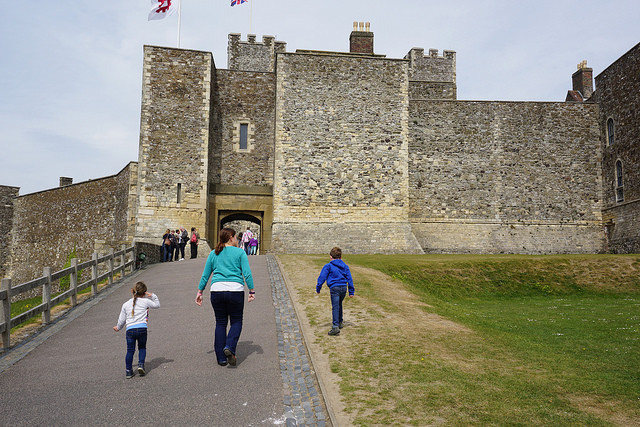 After a bit of a google and some research into possible destinations that would enable us to make use of our English Heritage and National Trust memberships, we settled on Dover – keen to visit the castle and see the White Cliffs. 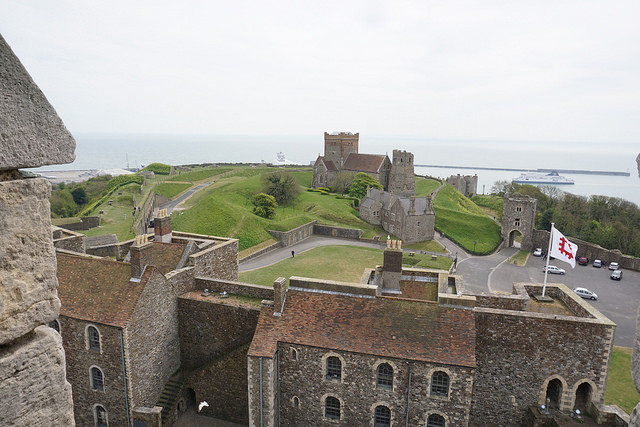 Early on Sunday morning, we loaded up the car and headed to Kent, arriving at Dover Castle soon after it opened. I was actually born in Dover, although moved away when I was very small. I’ve been back a number of times, and clearly passed through the town heading for the continent – but I’ve never been to the castle. What a mistake! 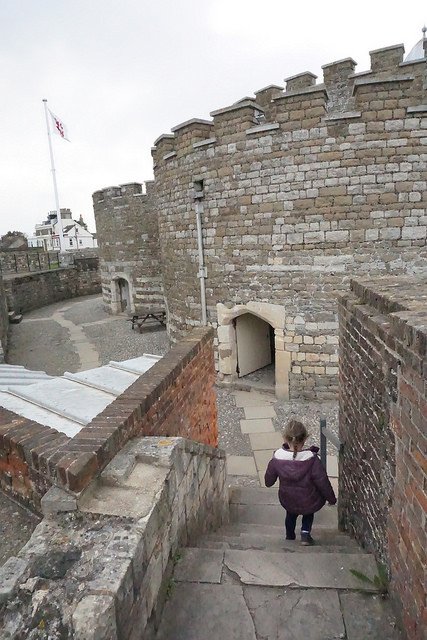 I was blown away by the scale of the fortress and the huge range of things to visit and do. We started the day by climbing right up to the Great Tower at the top of the site to hear the story of the castle in medieval times. We started our visit climbing right up to the top of the Tower. The view back down to the port across the rest of the site was brilliant. We watched so many ferries come and go! 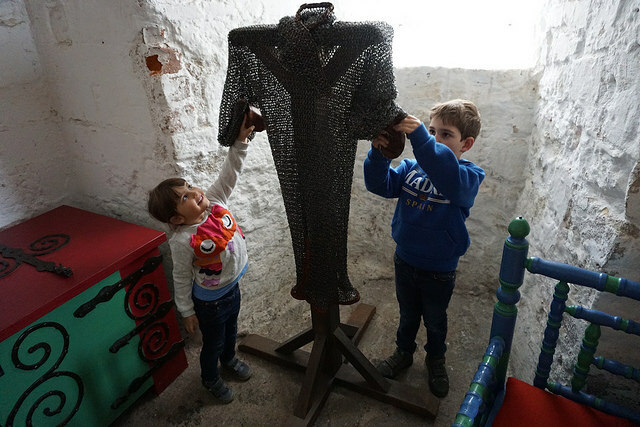 There were plenty of exhibits to touch and feel – the kids loved feeling the weight of chainmail, trying to imagine wearing it into battle. Just as we were about to leave the tower, a performance got underway capturing Alex’s attention! 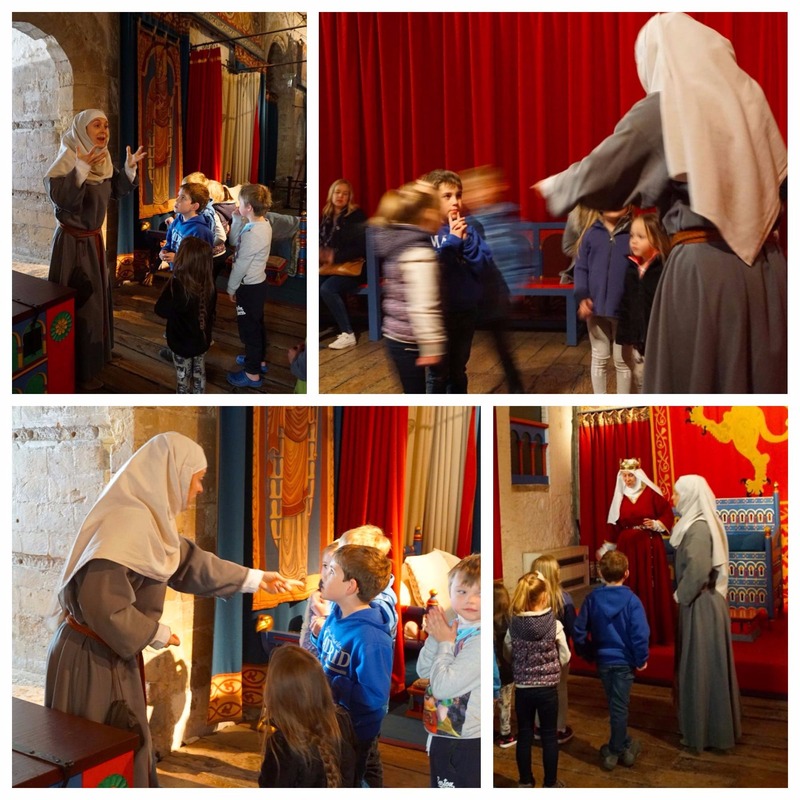 We found ourselves transported back in time into a medieval mystery! Alex met Queen Eleanor of Aquitaine and ended up going on a mission around the tower to find some lost papers that threatened to reach enemy hands! 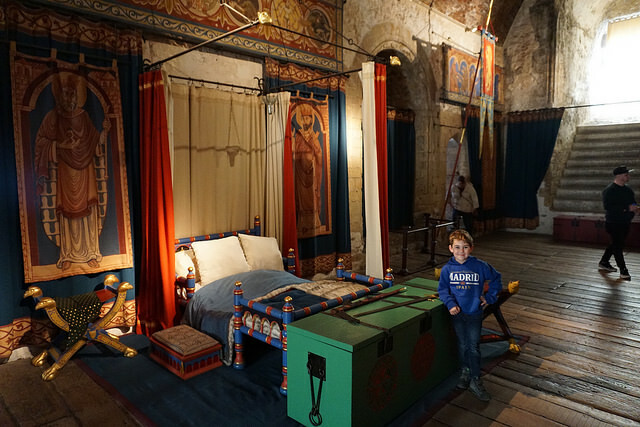 He absolutely loved it – and we all learned more about the castle’s history through the experience. Once the drama concluded, we headed down the site to the NAAFI restaurant. 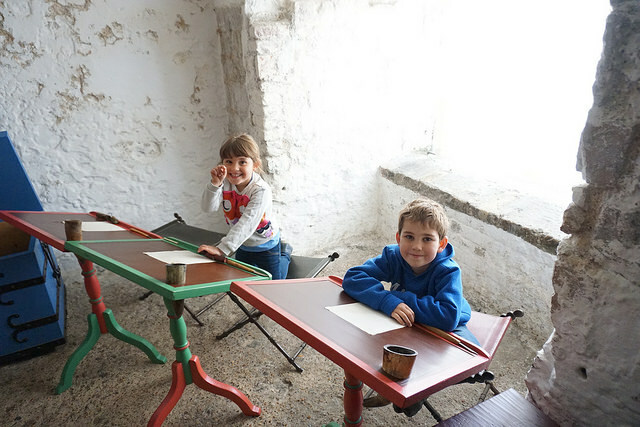 Once a military canteen, it now serves up delicious lunches and cakes. Yum! After spending the morning in medieval times, we jumped right to the 20th century for the afternoon. 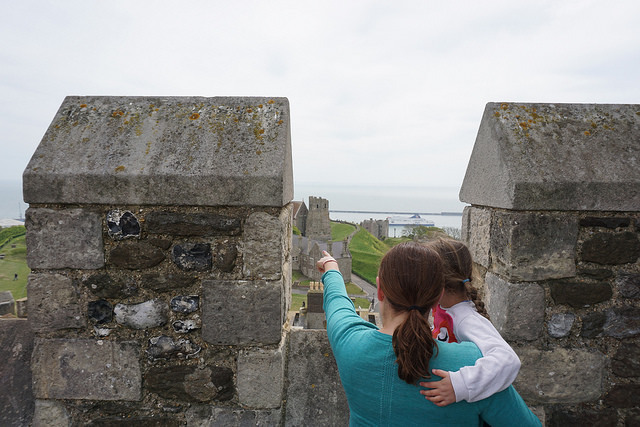 Tunnels in the cliffs under Dover Castle were used heavily during the Second World War – not surprising given how clearly you can see France across The Channel. We explored the underground hospital used in the last years of the war to treat injured troops, as well as civilian casualties from the many air raids on the town. It was a fascinating tour, full of the sights, sounds and atmosphere of the time. Scary stuff. We also visited the Admiralty Look Out on top of the cliffs, seeing the same view of the sea that the military watch teams would have seen in both World Wars. 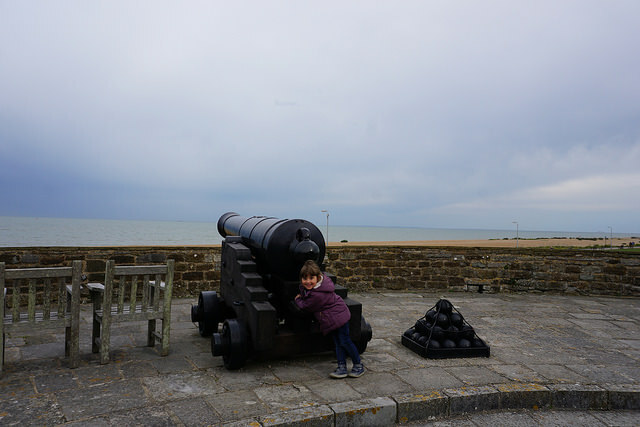 We ended our day at the castle wandering around the lawns and climbing on cannons! 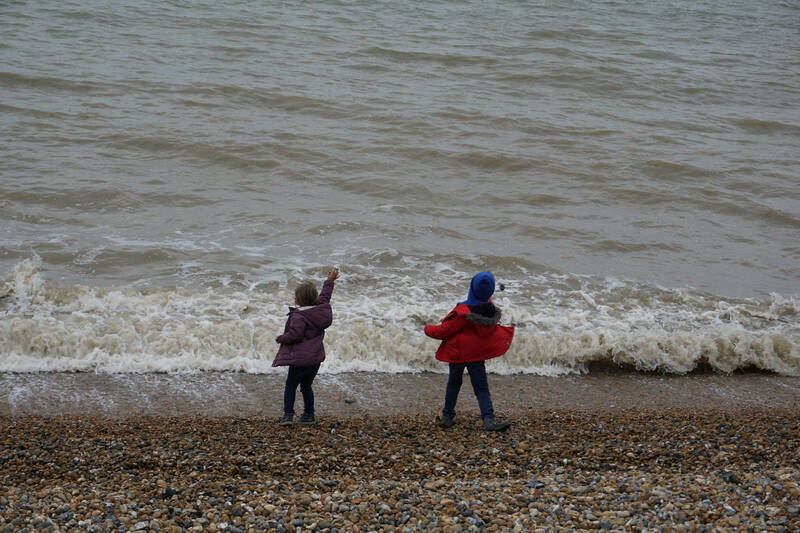 We’d promised the children a play on the beach before bedtime, so we eventually left the castle and headed to the beach at Deal (stopping for a quick walk by the house where I spent my first two years!). 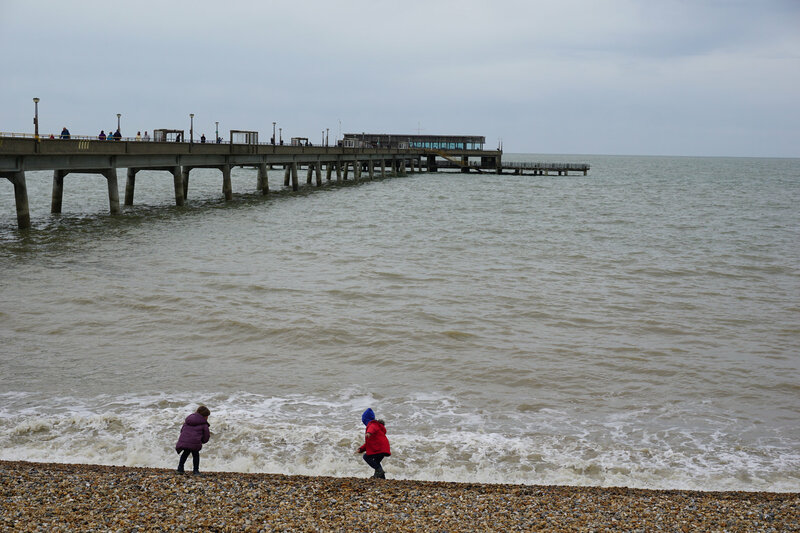 The weather got progressively worse and by the time we arrived in Deal, it was grey, windy and drizzly. 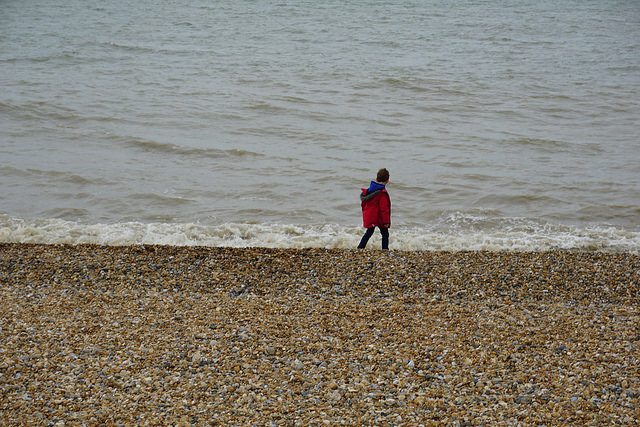 But we still hit the beach and the kids attempted some stone skimming in the choppy water! 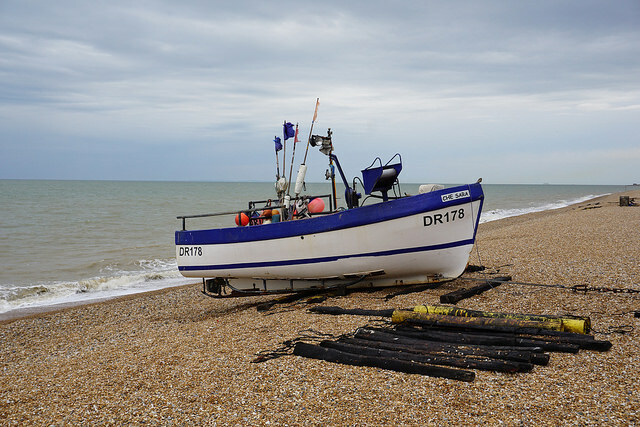 We wandered along the pebbles, having a good look at the little fishing fleet moored up on the stones. 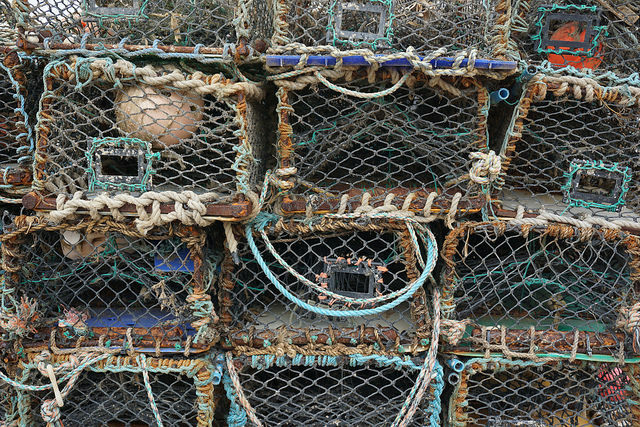 I loved all the lobster pots stacked up. 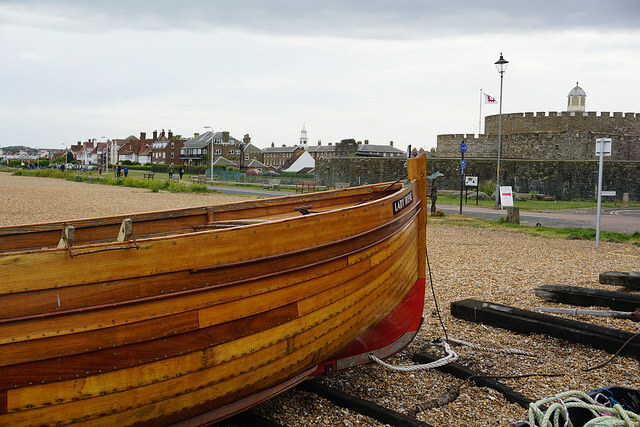 Over a beautifully varnished boat, we spotted another castle and an English Heritage flag – so decided to pop in to see Deal Castle! 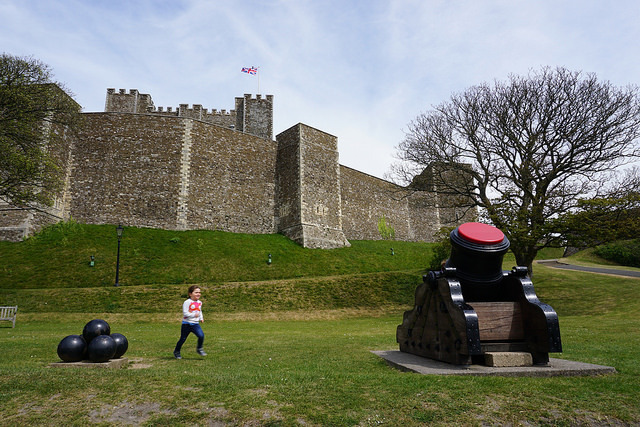 Deal Castle is so different to Dover Castle – very small and squat, and very round! It’s really interesting walking around the ramparts and seeing what a good defensive position the curved walls offer. 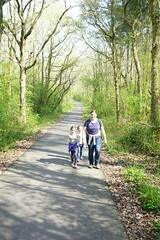 The children loved running around, up and down the various stairs. Here we are, looking out to sea for invaders! 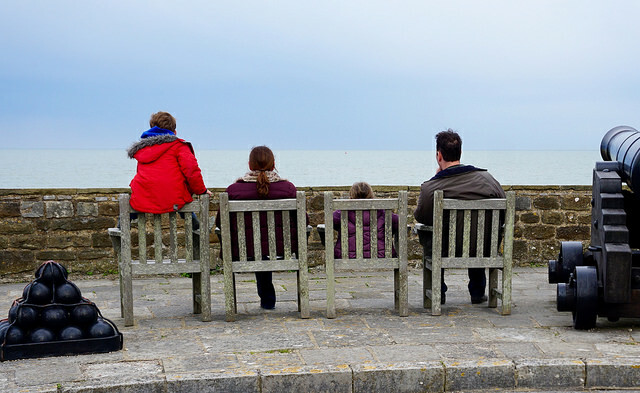 We wandered back along the sea front and found a little cafe for some fish and chips, before heading back to Dover for the night. 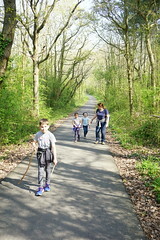 We’d booked into a Premier Inn right at the ferry terminal and all squeezed into a family room which was just fine for one night. The children were very excited that we were all sleeping in one room together. They were exhausted from all the exploring, so thankfully fell asleep almost immediately – leaving Matt and I to enjoy a glass of wine together in the ensuite! We were congratulating ourselves on a successful day and evening as we headed to bed – only to discover the poor Sophie had been sick all over her bed 😦 Cue much cleaning, re-organising and comforting (and much cursing from me that we’d been drinking wine so I couldn’t bundle everyone back in the car to London!) The reception staff were amazing, providing clean bedding for us. Eventually, we all settled down to sleep and thankfully had no further disasters! I’d been ready to head home as soon as we were awake, but Sophie woke up absolutely fine – hungry and excited for the day ahead! So we nervously headed for the breakfast buffet and were amused (and slightly alarmed) by how much Sophie ate. 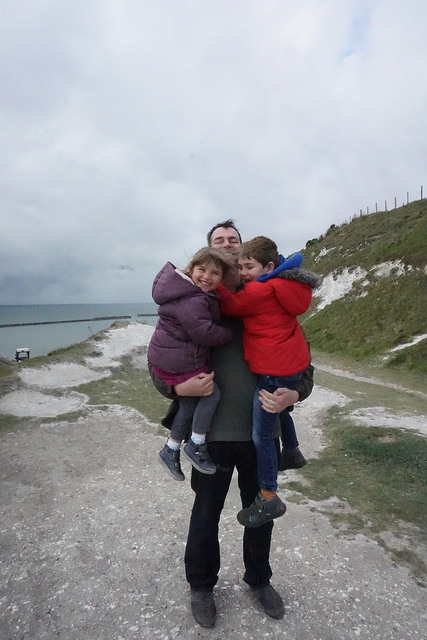 In need of some fresh air after being cooped up in the room, we made for the White Cliffs of Dover (which it turns out are managed by the National Trust!) It was incredibly windy, but we decided to brave the blustery weather and headed for the nearest view point. 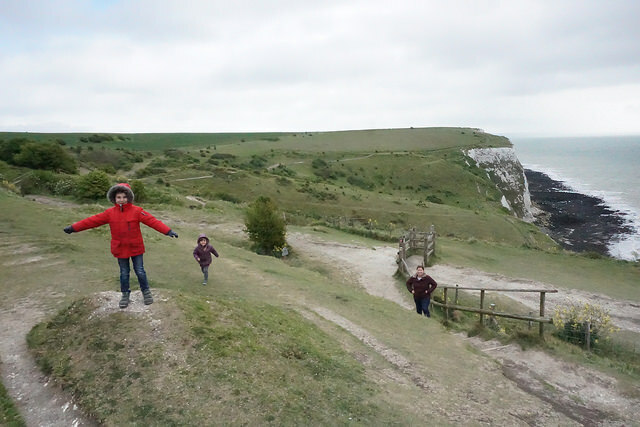 It was a lovely walk and the views were fabulous – we watched more ferries manoeuvre around the port and saw birds swooping over the cliffs. We attempted to pose for some photos, but it was too windy to stay still for long! Love my crazy daughter – clearly feeling fine! 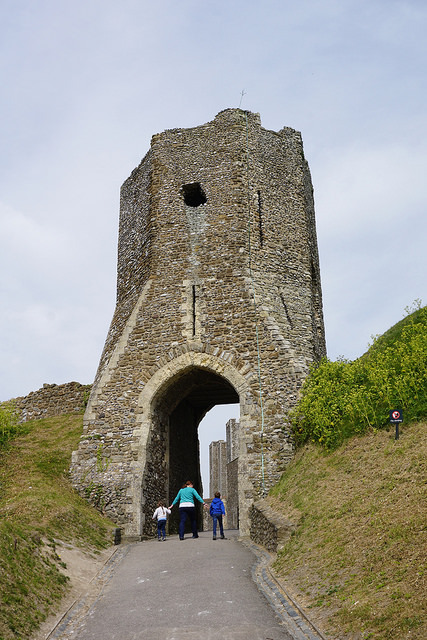 We soon headed back to the car, and popped back to Dover Castle for opening time so we could see more of the tunnels. The main tunnel complex is very popular, with restricted entry, so the queues can get very long – we hadn’t manage to get in the day before, but this time managed to get into the second tour of the day. And it was so worth the visit. I hadn’t realised that Operation Dynamo, the evacuation of Dunkirk in 1940, was masterminded from the tunnels at Dover Castle. 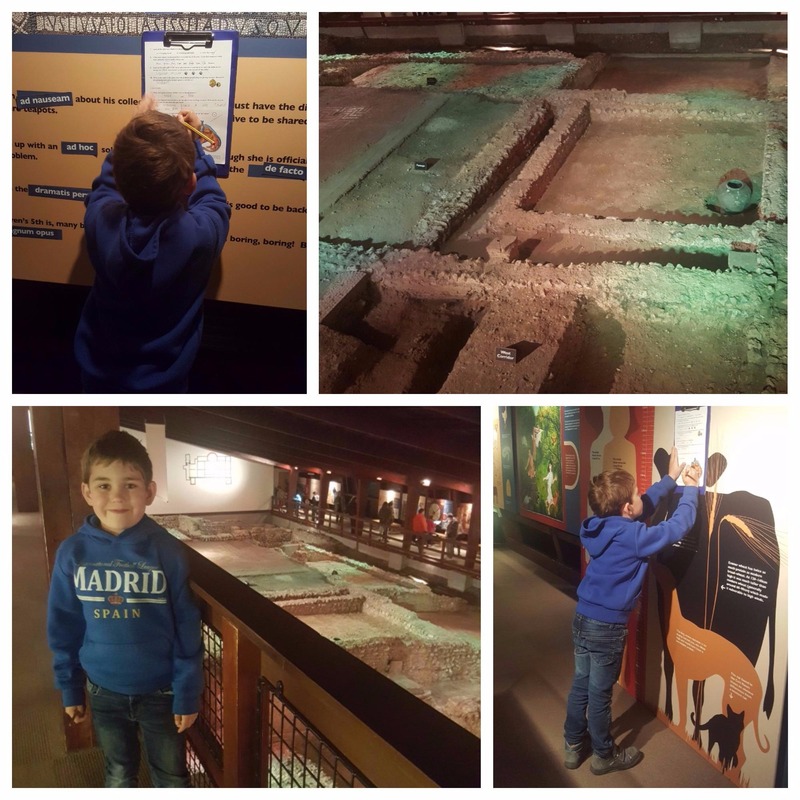 For nearly an hour, we explored the huge complex learning about what life was like working in the tunnels, and what an incredible achievement Dynamo was. It was absolutely fascinating and really quite moving. 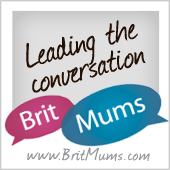 We had such a great couple of days – really escaping the craziness of daily life without having to travel far at all. We’re already planning our next weekend adventure! Oh no one of the kids being ill is always a worry when you are staying away, thank goodness the staff were good and she felt fine the next morning. Looks like lots of fun was had and the drama intrigued them and they enjoyed joining in and learning from it. 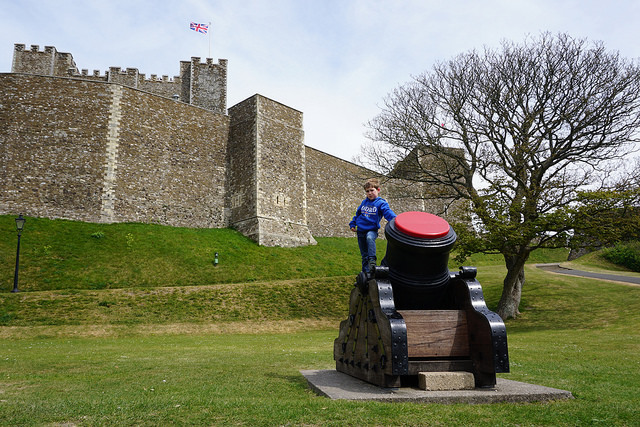 It sounds like a fun few days and Dover Castle with all its tunnels looks like a brilliant place to explore! Sounds like a really successful visit (minus the sickness episode) and a great way to take advantage of your passes and a bank holiday weekend. I’ve seen posts from the castle before, it reminds me I’m yet to visit and it certainly looks worth it. Like so many I only ever seem to end up in Dover rushing for a ferry! Great that you get a taste of medieval times and modern history. I’m not surprised you popped back on the 2nd day.